​Short bowel syndrome (SBS) occurs when a large portion of the small intestine and/or colon is removed. A shortened small bowel is a serious condition which makes it difficult to get the nutrition needed to grow because of malabsorption and intolerance of normal nutrition. Malabsorption can also be part of other allergic & gastrointestinal conditions. Neocate – easy to digest and absorb – can be part of the solution. SBS usually happens in early infancy, especially to babies who are born early, or premature. It is most common in infancy, but can also occur later in life. Because SBS has many possible causes - see below - it's hard to know how many babies and children are affected by SBS. Many babies and children with SBS may experience diarrhea, dehydration, poor growth, and may need to have nutrition given through their veins, which is known as either total parenteral nutrition (TPN) or parenteral nutrition (PN). Infants and children with SBS tend to have an increased risk of developing food allergies, which may be due to damage to the inner lining of the intestine causing the body to react to intact protein. The most obvious sign of a possible food allergy for a child with SBS would be diarrhea. The small intestine and colon play crucial roles in digestion. The small intestine absorbs a majority of the nutrients and fluids your body needs to function and the colon absorbs water: key things your child needs to grow. Loss of any part of the small bowel reduces the area available for absorbing nutrients and fluids. When a part of the small bowel is lost, the route that the nutrients take to get through the intestinal tract is disrupted. This means it is no longer a smooth process from the stomach to the end of the intestine, which can cause problems for the infant or child. Because of the surgical removal of part of the intestine, malabsorption of nutrients is common in SBS patients. Almost all babies and children with SBS will need to have nutrition given through their veins, which is known as either total parenteral nutrition (TPN) or parenteral nutrition (PN). Over time, many SBS patients will get more of their nutrition by mouth or feeding tube, and can reduce or stop getting nutrition through their veins. Following surgery, the remaining small intestine will need time to adapt to absorb enough nutrition by growing more cells to help increase the ability to absorb nutrients and digest formulas and foods normally. During this period, some SBS patients develop food allergies. 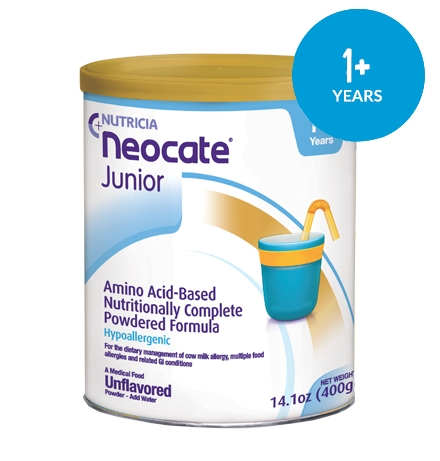 If a milk allergy is present, an amino acid-based formula like Neocate may be needed. 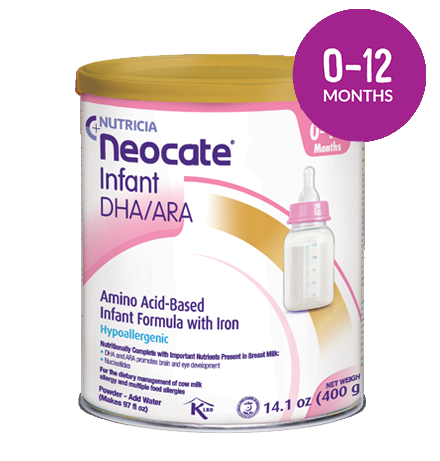 Neocate is different from other formulas and foods because it’s based on non-allergenic amino acids, the building blocks of protein, so it’s easy for infants and children to absorb. Neocate has neither whole nor fragmented protein chains that can trigger an allergic response. 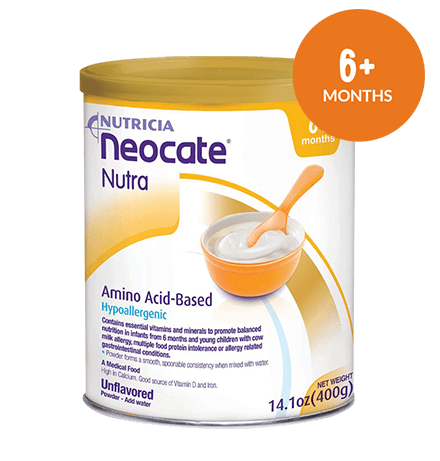 Amino acid-based formulas, such as Neocate, are the most hypoallergenic formulas available. Neocate is also made with a special fat blend. One-third of the fat in Neocate is easy-to-absorb MCT (medium chain triglycerides), which can help SBS patients with fat malabsorption. The other two-thirds of the fat in Neocate is LCT (long chain triglycerides), which needs to be broken down before being absorbed, which may help SBS patients with gut adaptation. More information on SBS can be found in our SBS parent guide. Please always refer to healthcare professional about routine nutritional monitoring. Serum levels of micronutrients, particularly phosphorus, should be routinely monitored by clinicians when Neocate is used as a primary or sole source of nutrition for patients with complex systemic disease involving multiple diagnoses and intestinal disease, especially in combination with tube feeding and/or a history of prematurity. 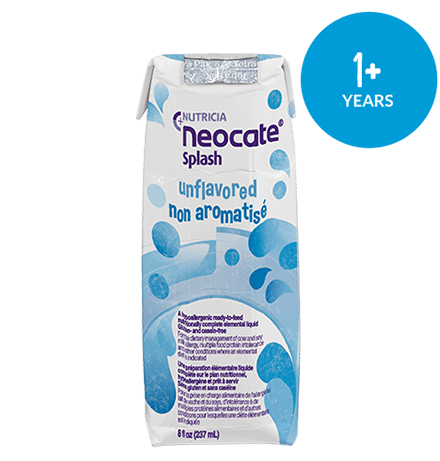 Neocate formulas are intended for use under medical supervision. GIKids is a site that provides information for kids and parents on digestive and nutritional disorders, including SBS. GIKids provides easy to understand information about the management of pediatric digestive conditions such as how they are diagnosed, the management of conditions, and our patient and parent resources. Many patients with SBS have feeding tubes. Two great resources for "tubies" are the Feeding Tube Awareness Foundation and The Oley Foundation.